Restoring my '67 650SS and struggling to identify the correct headlamp - I think the bike is currently non-standard (see photo). I think the correct headlamp shell should be chrome, with ammeter and switch hole? However Norvil tell me the switch should be fitted on the clock mounting bracket, not in the headlamp shell. Anyone got the correct info and/or photo? Wow - slightly cleaner thann mine! That's how I envisaged the Norvil description. If that's correct then that's what I'll go with. Many thanks Paul. I'd be interested in seeing more photos if that's your bike - clearly a stunner. Another one - seat - hump or no hump? I reckon hump came in at '68 - Novil say mine should have hump ('67). Cheers. Not shure if it is original. Thanks Howard - good information. Sorry about the quality of the photo. I didn't see any evidence of a steering lock when I dismantled the bike and my freshly powder coated top yoke has no hole in it. The fork stanchion centres seem to be 7". I guess I will get the 'special' bracket you mention (is that a Norvil part?) and a new switch, if required. It would not surprise me if this bike had been chopped around a bit as it had aftermarket, non standard headlamp brackets and a period glassfibre 'racing' seat. It is difficult to find reliable reference photos. 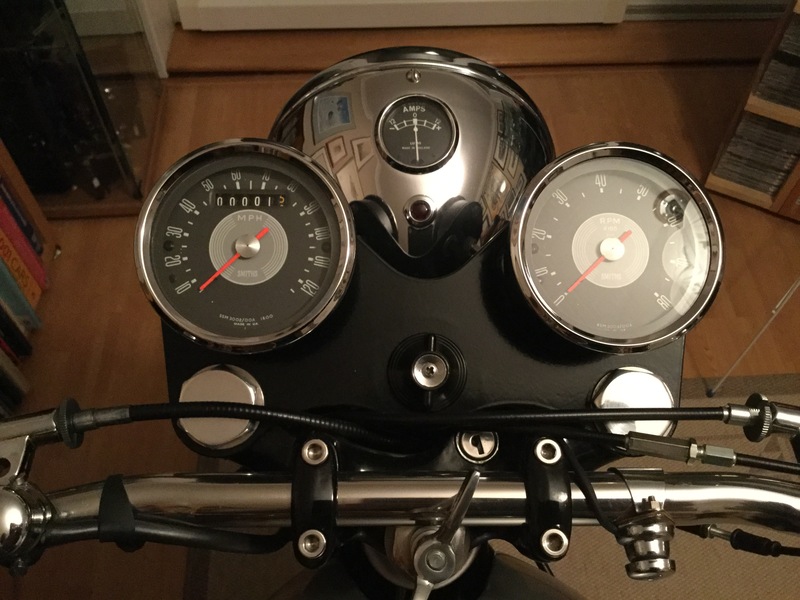 As the forks are wrong anyway I'm tempted to just refurbish the individual clock holders already fitted and use a replacement headlamp shell taking the ammeter and switch - just replace the one fitted, as it were. Norvil are also telling me that the headlamp brakets should be chrome, not black. I can't recall ever seeing chrome headlamp brackets on a 650SS? Confused and frustrated from Danbury!! Just to clarify, what are the centre-to-centre measurements for the early, and later yokes, Howard? By the sounds of it Leonard, you can make a fair copy of the later set-up, despite the earlier forks. 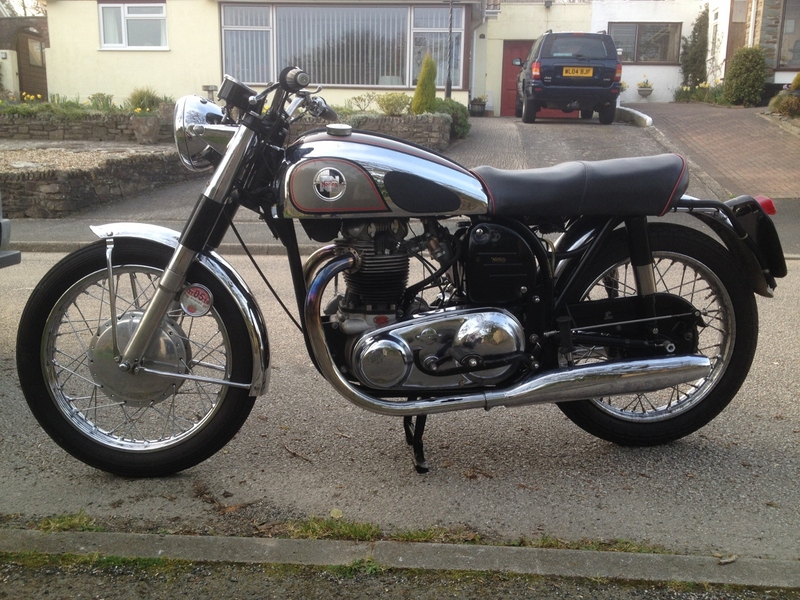 Good project, and lovely bikes. Thanks Howard. Those measurements have eluded me for a long time! The reason I ask, digressing slightly from the subject, is that I have a 1964 650SS-engined 1955 88 Wideline, with a Commando tls front brake, and the later wide yokes. I was pretty sure they were, but you have confirmed it. The top yoke has the steering lock hole. ps Photo added, to show tank; see thread on tank painting! My one concern with such a relatively powerful engine variant in the Wideline frame is the single front engine mounting point, rather than two, as on the Slimline. Had I carried out the work myself, I would have attended to that in the initial build. Seem ok though. I also have straight bars fitted now, which I prefer. The problem I have is the handlebar clamps on the top yoke are too low to allow the brake and clutch cables a straight run from the levers. I am fabricating risers at the moment, to raise the bars maybe 3/4", in order to give the cables a proper route. Hence in part my interest in this thread, particularly the photos of controls/top yokes. One can see the cables are tightly running across the top of the fork top nuts. However, I don't wish to high-jack Leonard's interesting thread! Usually export bikes had more chrome than home market bikes. Guess we foreigners like bling. Also some of them had a more colourful paint jobs. The 650SS was even delivered with a flamboyant green tank. Mikael. That is true about the colours. It was said that Norton would paint your bike any colour you wanted, provided your pockets were deep enough, although I don't know how true that was. My mudguards I believe are Commando items. The tank was not chromed when I bought the bike, but would have been originally, so I had it repaired, chromed and painted at very great expense. Interesting how these threads develop, isn't it? No problem Ian - as long as we're all learning and enjoying the ride I would never accuse you of 'hi-jacking my thread.' Nice bike, by the way. We all trust these 'specialist' suppliers to provide the right parts - they are supposed to be the experts - right? However, like Howard, I can't accept the chrome headlamp bracket argument and will order self coloured ones and get them powder coated black. Regarding the headlamp/switch bracket argument I'm changing my stance slightly - I guess I need to talk to Norvil about getting a bracket to fit 7" forks to try and make it look original and also question whether the mudguards they specified also fit 7" forks. I had heard that people fit early Commando mudguards to 650SS because the latter are no longer available, the tools being scrapped in 1977. I assumed 'early Commando' was due to different fork sizes...but now I don't know as Howard reckons they changed in 1964. Leonard. I believe my mudguards are early Commando ones, and as we now know, my forks are the wide ones. I will check the clearance between the forks & mudguard on Sunday. Can't do it tomorrow as I am off to the Shepton Mallet show, 130 miles each way, so an early start. However, they are much slimmer, for want of a better word, than the original SS ones, which I thought were rather large for a sports model. It doesn't matter with mine. It is all Norton, but ranging from 1955-1970. However, if originality is important, you may have to take a view on it. Hi Ian, If you intend to fit bar risers to solve the tight cable problem you may have to modify the steering damper if fitted. The risers work well on our Atlas but were fiddly to fit ,a 2 person job to hold everything .